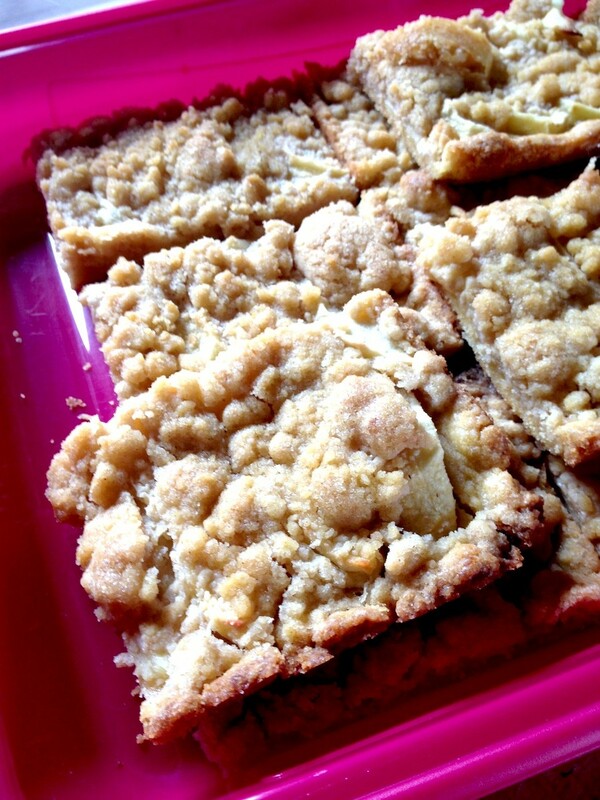 This easy German apple streusel cake is one of our favorite cakes (streusel means crumbles). It can be varied with the Damson prunes or apricots. It is the ultimate Kaffee and Kuchen Cake in Germany - a typical coffee cake. The cake is easy to make, even baking beginners can be proud of themselves. Happy Baking! - Combine all ingredients for the dough, mix until everything is combined well, then knead dough until it has a firm consistency, it should not fall apart. Form to a ball. - Wrap dough in foil and keep cool for at least 30 min. - Peel apples, remove core, slice them, mix with cinnamon. - Layer a deep baking tray or spring form with parchment paper or grease it thoroughly with butter. - Gently press the dough into the form or tray about 1 inch thick. - Place apples on top and for the streusel combine all ingredients, then crumble on apples. - Bake in pre-heated oven for 20 min on 350 F (175C).